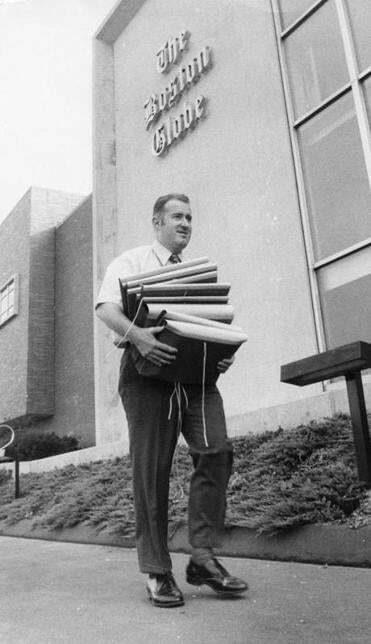 Among his many roles in the newsroom, Mr. Driscoll (pictured in 1971) served as assistant to legendary Globe editor Thomas Winship. John S. Driscoll, who took over leading the newsroom of The Boston Globe at a time of turmoil and guided the paper for nearly seven years with a sure, steady hand, died Tuesday. He was 84 and had lived in Rye, N.H., in retirement. Arguably no one in the Globe’s history worked in so many newsroom jobs while ascending to the top, and few newsroom leaders in Boston or elsewhere were as universally respected and admired as Mr. Driscoll. “Jack was a prince of a human being with bedrock news values that helped define this institution long after he left,” said Brian McGrory, the Globe’s editor. In 1993, the newsroom gave Mr. Driscoll a standing ovation when he stepped down as the Globe’s top editor and was succeeded by Matthew V. Storin. When Mr. Driscoll stepped down, Globe publisher William O. Taylor II praised his leadership. Mr. Driscoll spoke to the staff that February day in 1993 of his pride in creating Globe foreign bureaus in Berlin and Moscow, and inaugurating six zoned weekly sections that provided in-depth coverage to suburban communities. The responsibilities of running an expanding news operation in the late 1980s and early ’90s were enormous. Including his final year as a Globe vice president, Mr. Driscoll’s tenure stretched for more than four decades — from his days as a high school correspondent from his hometown of Melrose to 1994, a year after the Globe was sold to The New York Times. He made no secret of his vast affection for working in the newsroom and his tepid feelings about administrative jobs. “I have never wanted to go upstairs. I have never wanted to be a vice president,” he told the Boston Phoenix in 1992, the year before he was made a vice president. As a reporter, supervisor, or managing editor, he played a role in efforts that brought the Globe many honors, including five Pulitzer Prizes. Mr. Driscoll served as assistant to legendary Globe editor Thomas Winship, and then as assistant to the executive editor, during the Globe’s Pulitzer Prize-winning coverage of the Boston school desegregation in the mid-1970s. “Emotions were so high in that period,” he told Boston Magazine in spring 1986. Mr. Driscoll served on the Pulitzer Prize board from 1991 to 1995, and in 1994 he was national chairman of the Future of Newspapers Committee for the American Society of Newspaper Editors. As a teenager, he began his newspaper career as a Globe correspondent and was a part-time “sports receiver” at the Globe a few years later, while a Northeastern University student. After post-college stops at the Union Leader of Manchester, N.H., the Haverhill Journal, and the United Press International wire service, he returned to the Globe in 1958 as a sportswriter and moved to the copy desk the following year. His other jobs included serving as assistant night editor and night editor. As assistant executive editor, Mr. Driscoll had oversight for several award-winning Spotlight and investigative series. Mr. Driscoll’s resume of Globe jobs was so comprehensive that he moved with ease throughout the building — a familiar, friendly face to everyone at any desk in any department. He went on to serve as managing editor of what was then the Evening Globe, the daily edition, and the Sunday Globe. Mr. Driscoll was named executive editor in 1982. Many in the newsroom expected him to succeed Winship, who stepped down as editor at the end of 1984. Instead, Taylor named Michael C. Janeway to the newsroom’s top post. Mr. Driscoll continued serving as executive editor during Janeway’s 14-month tenure, taking over the editor’s duties when Janeway left in March 1986. Mr. Driscoll’s promotion was made official the following year. That March, when Taylor told the newsroom that Mr. Driscoll would take over the editor’s duties, the staff greeted the news with vigorous applause. “I see us as a newspaper that is serving the reader to the fullest extent possible; the very best regional paper there is — not a parochial paper, but a paper that caters to the local, national, international news and feature needs of its readers,” Mr. Driscoll told the staff. Almost all of Mr. Driscoll’s Globe career took place during the multigenerational ownership of the Taylor family, whose leadership he valued. “The difference between the Globe and other papers of today is continuity and family ideals resulting from singular ownership,” he said in a June 1986 interview for a Globe in-house publication. “And it seems to be more relevant today than ever,” he added. John S. Driscoll was born in Melrose on Aug. 31, 1934, the ninth of 10 siblings. His parents were John Francis Driscoll, a salesman who was known as Frank, and Mary Fallon, who was active in neighborhood and church activities after the children were grown. His parents met in Massachusetts and lived for a time in California, arriving in 1929 at the outset of the Great Depression. As they considered returning to Massachusetts a few years later, Mary Driscoll was concerned about the family crossing the country in a 1927 Packard. Though the family was large, “the attitudes of the sisters and brothers toward one another can be summed up briefly: There never was a time when any two were not speaking to one another or were harboring bad feelings,” he wrote. He based his memoir in part on love letters between his parents — which were written while his father was a traveling salesman — along with family scrapbooks and a “Scribble-In Book” his mother left behind. Mr. Driscoll graduated in 1952 from Melrose High and received a bachelor’s degree in 1957 from Northeastern. He was a college sophomore when his father died, and he worked part time at the Globe while attending Northeastern. Mr. Driscoll returned to the Globe as a full-time sports reporter in 1958. That same year he married Dolores A. LeSaffre, who also had graduated from Melrose High, and who received a bachelor’s degree from Boston University. They lived in Melrose and Topsfield before moving to Rye, N.H., in the years after Mr. Driscoll retired. Mrs. Driscoll, who died in 2015, had worked as an administrative assistant and a teacher’s aide after their four daughters were grown. The Driscolls were both active in the La Salette faith community, and with the National Shrine of Our Lady of La Salette in Ipswich. Through church activities, Mr. Driscoll taught and coached teenagers, and also served on committees for faith and work forums and retreats. In the early 1990s, he was a cofounder of an alliance that worked to foster better understanding among heterosexuals and the LGBT community. Mr. Driscoll served on several boards, including those of the Judge Baker Children’s Center in Boston and the Learning Skills Academy, a special needs school in Rye for students with learning disabilities. His cultural tastes ran to earlier centuries. In the 1986 interview with Boston Magazine, Mr. Driscoll named Mozart as his favorite composer, and two religious texts as his favorite books: “Breakthrough,” by 14th century theologian Meister Eckhart, and “The Cloud of the Unknowing,” an anonymous work of Christian mysticism that was written more than 500 years ago. In 1994, on his 60th birthday, Mr. Driscoll retired from the Globe. In a brief accounting of his career, he wrote that he had given the publisher, William Taylor, a year’s notice. “It was the best secret he ever kept,” Mr. Driscoll wrote. Uninterested in continuing at the Globe after the ownership change to The New York Times, Mr. Driscoll formed an electronic publishing consulting company. Mr. Driscoll, who had been a member of the American Society of Newspaper Editors and the Associated Press Managing Editors Association, was part of a 1977 national team of journalists that investigated corruption in Arizona after Don Bolles, an Arizona Republic investigative reporter, died from injuries suffered in a car bombing the previous year. In 1987, Mr. Driscoll was one of three journalists honored with a Yankee Quill Award from the New England Chapter of the Society of Professional Journalists, Sigma Delta Chi. Along with serving on the boards of some tech startup companies, Mr. Driscoll kept his hand in the writing field after the Globe as a contributor to magazines and by authoring the Massachusetts section for the Encyclopedia Britannica when it was updated nearly two decades ago. “Essentially, these new journalists are learning by doing with an enthusiasm that is contagious,” he wrote in the book, published in 2008. Mr. Driscoll leaves his four daughters, Lee Anne Lake of Nottingham, N.H., Jennifer of Newton, Maryellen of Palatine Bridge, N.Y., and Susan Wilson of Rye, N.H.; a sister, Betty Connolly of Melrose; a brother, David of Melrose; and seven grandchildren. A wake will begin 3 p.m. Friday at Robinson Funeral Home in Melrose. A funeral Mass will be said at 10 a.m. Saturday in St. Mary Church, his parish while growing up in Melrose. As editor of the Globe, Mr. Driscoll insisted that leadership was a collaborative enterprise. “I think that if you were trying to run The Boston Globe news operation alone, it would be almost too much,” he told Boston Magazine in 1986.